The hedge fund manager and investment bank call the electronics retailer a contrarian value pick. BOSTON (TheStreet) -- Value investor David Einhorn, who runs hedge fund Greenlight Capital, disclosed a position in out-of-favor electronics retailer Best Buy (BBY - Get Report) in his latest quarterly letter, ahead of his firm's official 13-F filing. Best Buy's stock has fallen 30% in 12 months, underperforming U.S. stock indices. Einhorn's pick merits investors' attention. Best Buy has fallen 8.9% this year, and Einhorn, who established his position at an average price of $33.33, is in the red on this bet. Still, he makes a compelling argument for the down-but-not-out security. Of note: Greenlight's long-run annualized return since 1996 is close to 25%. It ranks as one of the best-performing U.S. hedge funds, despite a focus on mainly domestic equities. Also, unlike its peers, Greenlight has a small staff and rarely trades. Its operations are focused on researching and then owning, or shorting, stocks, not vacillating on its investments, as many firms do. In his quarterly letter, Einhorn stressed that investors are far too concerned that Best Buy has reached its growth limit and will suffer declining sales in the future. In particular, he views Best Buy's holiday dip as a fleeting issue rather than a signal of looming obsolescence. In essence, Einhorn is making a bet against online shopping for electronics. He sees Best Buy offering customer value through "store help, merchandising, service and being able to walk out of the store with your purchase." The challenge of seeking a refund or repair for an Internet-purchased high-ticket item, such as a 3D television, illustrates Einhorn's point. Internet shopping may dominate for low-ticket, easily replaceable items, but brick-and-mortar will likely retain a lock on expensive goods. Despite such security, Best Buy will face indisputable headwinds as its U.S. business matures in coming years and it fine-tunes its combination sales strategy, offering products through both its Web site and retail outlets. Einhorn concedes that square footage will drop by a couple percent a year. Still, he is encouraged by the Best Buy Mobile concept. Though rarely discussed, Best Buy is among the world's largest retailers of cellular phones, offering models from all major carriers, at stores and stand-alone mall kiosks. It was the first third-party retailer to start selling the Apple ( AAPL iPhone and iPad. Einhorn is also optimistic about Best Buy's international prospects, going forward. 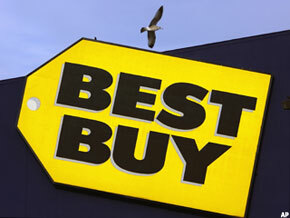 In fiscal 2011, Best Buy generated 26% of its revenue from outside the U.S. However, the vast majority came from similarly developed markets, with 11% in Canada and 11% in Europe. China accounted for 3.9% of sales, presenting an expansion opportunity. Furthermore, with $3.1 billion of share repurchases 10% of the current float slated for this fiscal year, Einhorn sees an upside catalyst for the stock, which, to be expected, is trading at a discount multiple. It sells for just 8-times Einhorn's 2012 earnings projection and offers an estimated annual free-cash-flow yield of 20%, assuming efficiency is achieved. The balance sheet is clean. With $1.7 billion of cash and $1.7 billion of debt, Best Buy has a less-than-ideal quick ratio of 0.5, but a modest debt-to-equity ratio of 0.3. Quarterly return on equity, at 20%, and return on assets, at 7.2%, illustrate solid profitability. In Einhorn's camp is Credit Suisse, the most bullish global investment bank on Best Buy, ranking its stock "outperform" with a $42 target, suggesting a gain of 35%. Credit Suisse, encouraged by Best Buy's April analysts meeting, has a contrarian view on the company, whose stock receives positive reviews from an unimpressive 42% of researchers. Citigroup ranks it "sell" and expects a drop of 15% to $27 within the next 12 months. Credit Suisse says the roadmap laid out by management is both credible and underappreciated. While guidance remained steady at the recent analyst meeting, management provided "a strategy for each segment of the business, from big screens to tablets, and a plan to improve return on invested capital through those actions, lower capital expenditure and higher share buybacks." Despite optimism, Credit Suisse expects Best Buy's stock to stay in a trading range until later this year, as a stabilization in comparable-store sales, expansion of share repurchases and success in mobile will attract investors. Valuation is the bank's sticking point. The stock is at the very bottom of its 10-year range of earnings multiples, with a reduction in the float looming. Thus, Best Buy is historically cheap. The PEG ratio, a valuation metric that discounts predicted earnings growth, at 0.8, suggests that Best Buy's stock is selling 20% below fair value. In a market that is rife with froth, ranging from commodity plays like Freeport McMoRan ( FCX to cloud-computing darlings like Salesforce ( CRM, Best Buy ranks as one of the few compelling value ideas. Other potential stock catalysts include: driving a higher penetration in appliances, pending Tablet Central segments in each store and improved margin negotiation with vendors. Best Buy's gross margin widened from 25% to 26% in its fiscal fourth quarter, though the operating margin declined from 7.8% to 7.6%. Although Credit Suisse believes Best Buy's Internet business "is well below that of its competitors," it expects increased investment in that segment. The company's online order, in-store pickup strategy will likely have relevance, offering a way to expand store efficiency and boost sales without capital expenditure. Credit Suisse would like to see a more aggressive store-closure strategy, but doesn't feel it's yet a pressing issue, given initiatives. Best Buy announces fiscal first-quarter results June 14. Wall Street forecasts a 9% drop in adjusted earnings to 33 cents and a 1% dip in sales to less than $11 billion. Although Credit Suisse's and Einhorn's respective bullish theses may not play out perfectly during 2011, both make compelling arguments for considering the stock at its current valuation. Individual investors should investigate Best Buy. GM: The Most Undervalued Company?